If your 5-year old is better at programming your PVR than you, don't worry - you're probably not alone. Kids are becoming increasingly technology-savvy from a younger age, a new study shows. 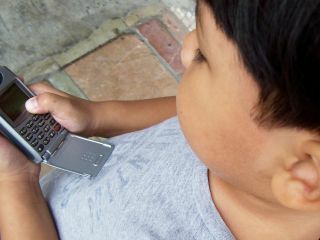 Children begin using consumer electronic devices at the average age of 6.7 years old, down from 8.1 years old in 2005, the NPD Group research shows. Children are exposed to televisions and desktop computers at an even younger age, as young as 4 or 5 years old. They wait a bit with satellite radios and portable media players though, with an average initial exposure at 9 years of age. The average number of consumer electronic devices owned and used by children has fallen slightly compared to previous reports. Almost a quarter of households surveyed said they hadn't bought any electronics devices during the past 12 months. Of those that had invested in gadgets over the past year, mobile phones, digital cameras and portable media players topped the list. Children are most likely to own portable media players, portable video games and digital cameras. Mobile phones and portable DVD players are also proving popular with kids. "Kids are drawn to the latest and greatest digital devices just as their parents are," said Anita Frazier, industry analyst with the NPD Group. "They appear to have no fear of technology and adopt it easily and without fanfare, making these devices a part of their everyday lives." The report also found that children use electronic devices about three days a week. Topping the list were non-portable televisions, which showed 5.8 days of use. Mobile phones averaged at 4.3 days and digital video recorders 4.1 days.